These guidelines will provide guidelines around several design parameters, offering flexibility for some design elements, while maintaining consistency and cohesion in our current templates and materials, thereby ensuring an efficient design and approval process. These guidelines apply to our publicly-facing consumer marketing pieces and referring physician communications, and not necessarily to our publications and internal communications. For the items below, consideration should be given to message content and strategy, media placement, timeframe, audience and budget. Additionally, our director of creative services, creative director and marketing directors should be involved in consultative review prior to concepts being presented to clients. Our CCO must be in the review loop for campaign materials prior to those materials being presented to the client. In rendering a final design decision, the directors of marketing will weigh input from all sources — client, audience (including focus group feedback if available), other directors, project managers/coordinators — as well as rely on professional training and experience to make the best decision. Images can contain isolated (or cut-out) subjects against a solid background or full-frame subject matter. Images may be treated with overlays and toned as appropriate for the piece. 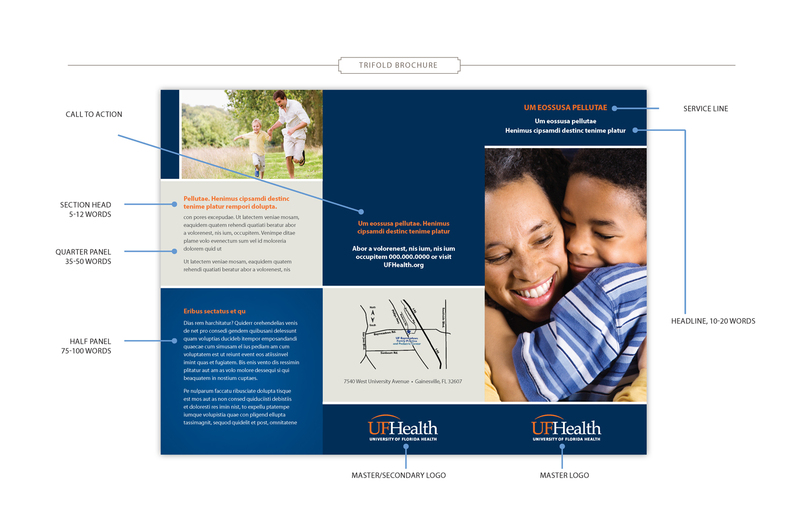 Inset or supporting images are permissible in advertisements, collateral and other single-page creative executions, so long as they advance the narrative of the message, support the dominant image, and do not clutter the piece. No more than three inset images are permitted. The images must not encroach or impede on the subject(s) of other images, and must be contained in a box. They cannot bleed into copy or other images. Depending on the images, they may need a separation line. Images/photos must be well composed, well lit, and professional. Images must be taken by professional staff or a freelance photographer or drawn from a professional stock image site, preferably Getty Images. For non-pediatric advertising campaigns only, the use of line art illustrations may be explored when it strengthens, enhances or advances the narrative in the ad, and impresses upon the reader the narrative’s core messages. The illustration—which is meant to enhance the dominant image, not replace it—must be a solid, single color and may not be cartoonish or iconographic. All other necessary ad elements must be featured and not compromised in any way. Any ad concept that uses illustrations in this way must first be vetted through a creative brief, with explanation as to how the aforementioned criteria are met. 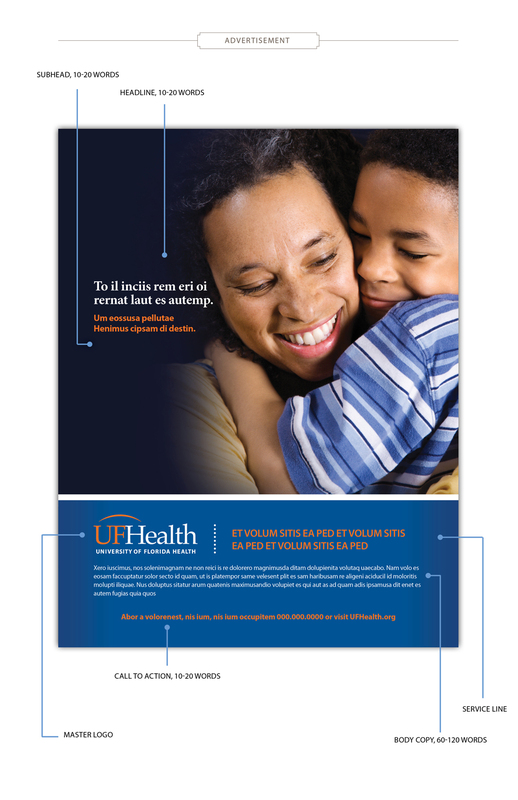 UF Health communications leaders must review and approve the brief prior to production. 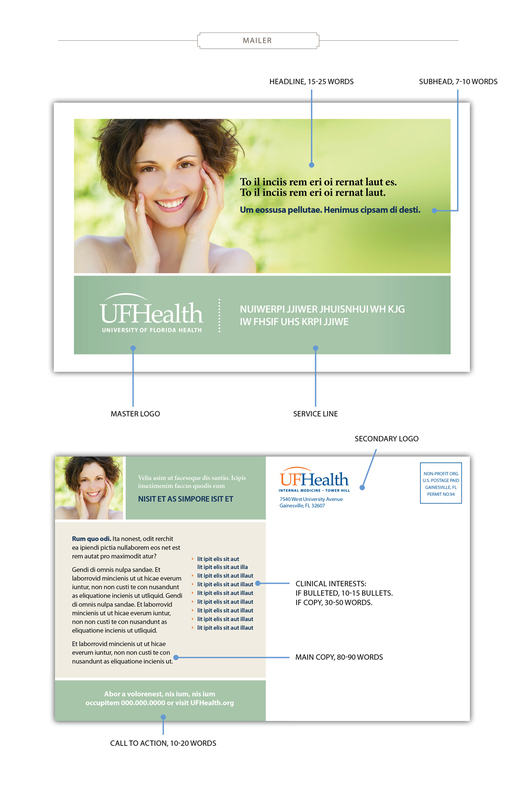 Illustrations are never to be used as logos, unique identifiers, service line differentiators, or brand elements. 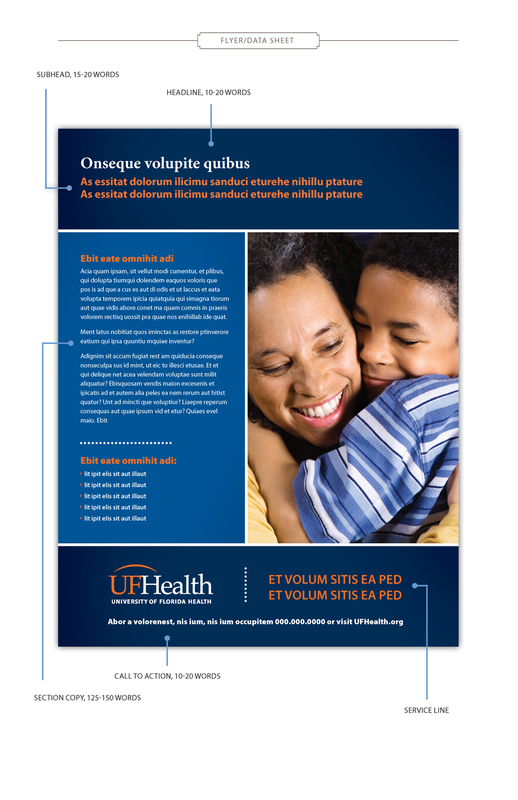 Illustrations that appear “cartoonish” or that are hand-drawn are not permitted except in pediatric or Children’s Hospital pieces where appropriate, such as the 2016 Pediatric Services campaign. 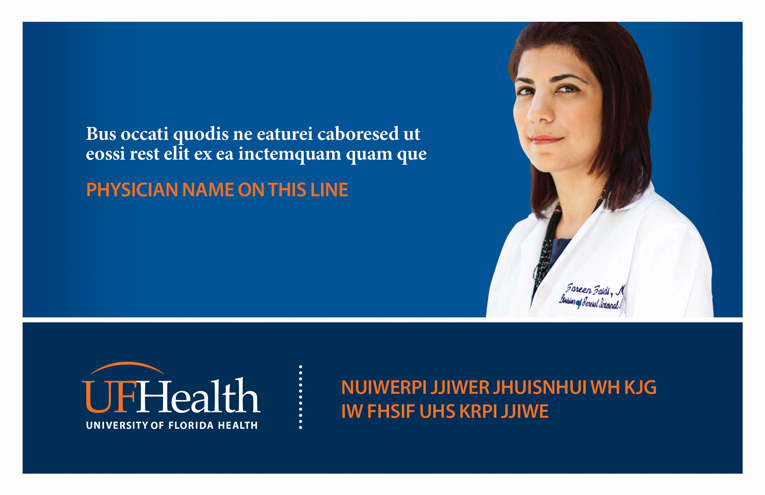 Strong consideration needs to be made to not use stock images when representing UF Health medical providers. Images of our own staff is preferable. Lifestyle images of a person or people returning to or engaging in a life activity. This must be the dominant image used in advertising and marketing collateral (especially on the cover of multipage pieces.) The image must display the person or people as the focal point. Exceptions can be made only when the story or copy is specifically about a piece of innovative equipment. There are some exceptions below. When promoting awards and accolades (such as U.S. News & World Report rankings), it is permissible to use badges/logos/seals. 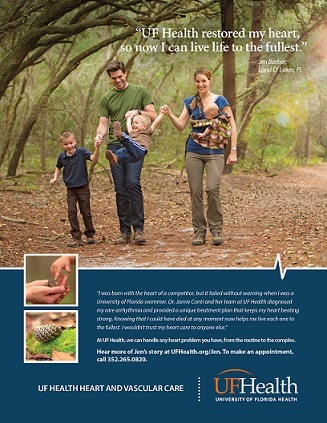 For UAA initiatives, it is permissible to use sports-related images that do not contain people. 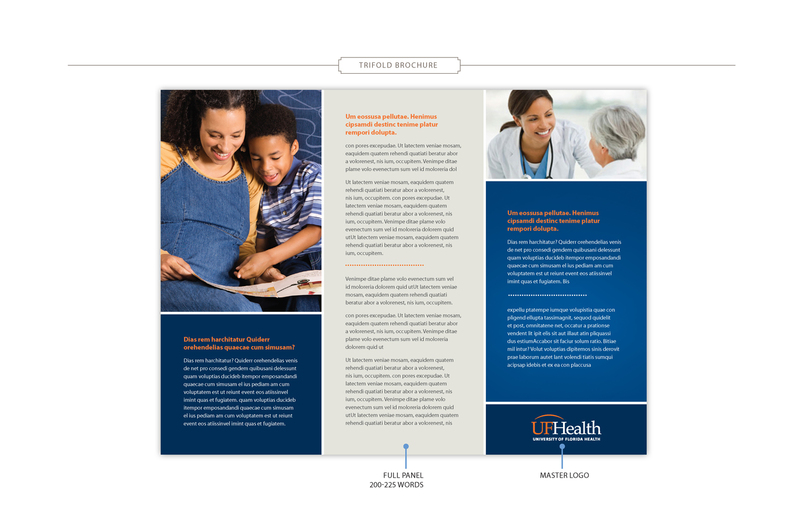 Medical, scientific, and X-ray images/illustrations may be used as a dominant image on referring physician materials to help support the content of the material. Portraiture images—images that tell a story or reveal an emotion via expression, wardrobe, setting, etc. These images are emotionally compelling and captivating. Kinetic photography—images that show movement and action. Nature or landscape photography—to depict abstract concepts and symbolism. Still life images of objects (groups or single objects). 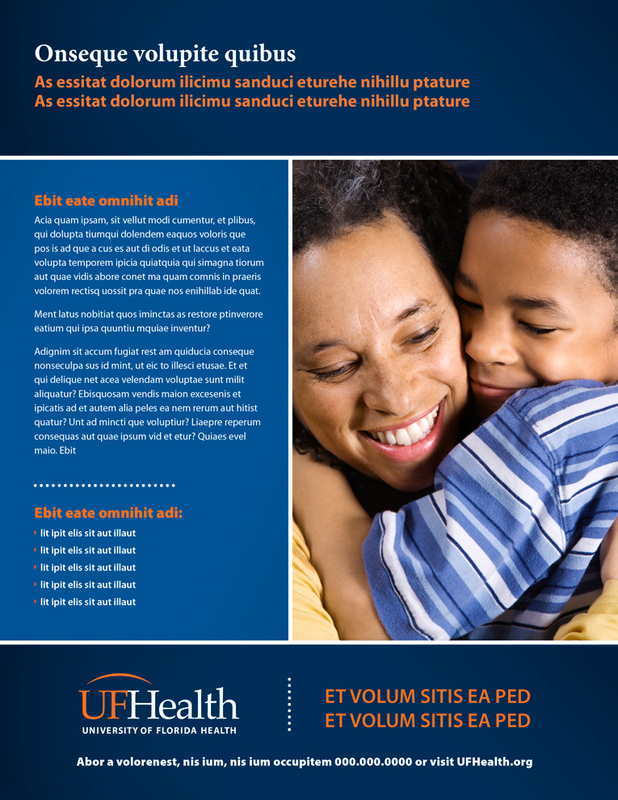 Illustrations: drawn or vector art, including medical illustrations, may only be used on pieces for referring physicians or patient education pieces. 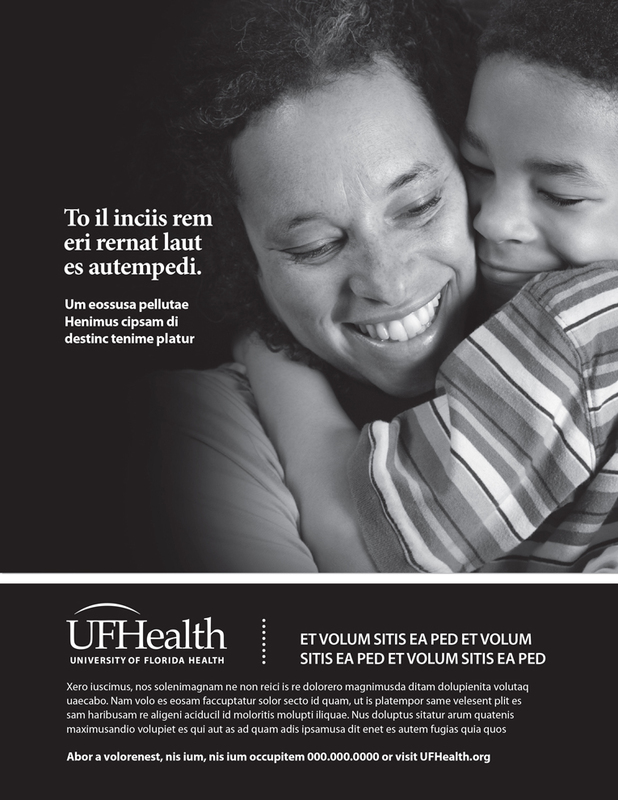 As noted above, illustrations may be used in pieces where pediatrics or the Children’s Hospital is the focus. 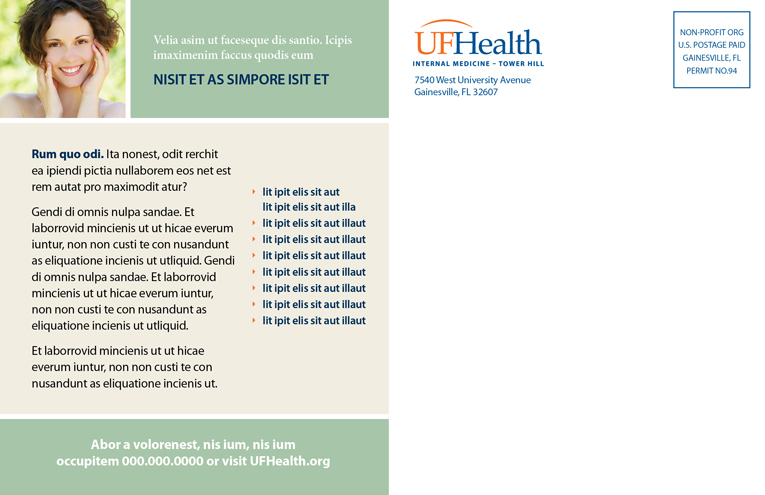 Illustrations of the UF Health logo are not permitted. Facility and appropriate medical images (i.e. X-rays) can be used as inset images. 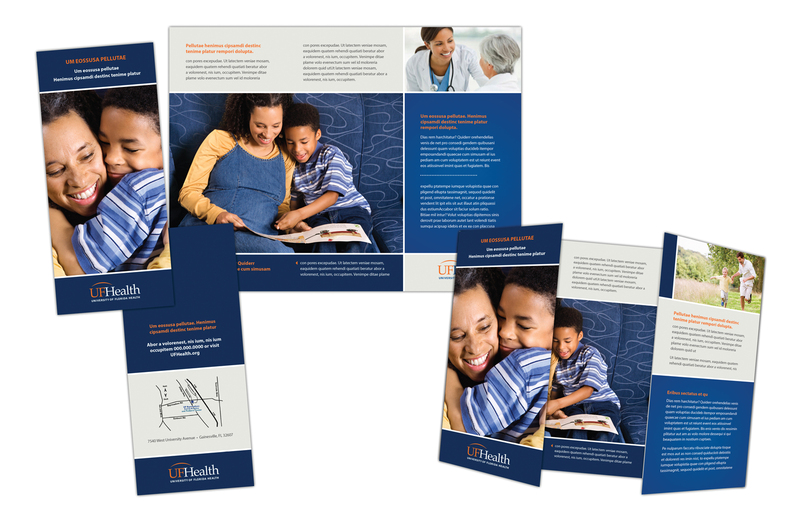 Inset or supplemental images portraying interactive care with a person or people versus seeing a person or people undergoing specific treatment, such as an MRI, may be used in advertising and marketing collateral. The Creative Services website features a thoughtful spectrum of permissible colors, grouped by specific categories, for use. It is acceptable to extract a primary color from the dominant image of the piece. White/reverse text or logos are not to be used over specific colors in the color palette as marked. Certain color treatments will not be acceptable for newsprint because of a lack of accurate and effective reproduction. Variations in font styles are allowed (italics, light, bold, for example), as long as they are our corporate fonts. Only approved fonts that are within our corporate font family may be used. Bokka is permissible in pieces where pediatrics or the Children’s Hospital is the focus. The accessory font (Journal) may only be used in headlines in conjunction with one of our corporate fonts. It may only be used in short phrases of one to three words on invitations and advertisements. Logo can be positioned in a box or a bar that spans the horizontal width of the page or occupies a vertical space. Logo can be left aligned, right aligned or centered. Do not outline a logo box. 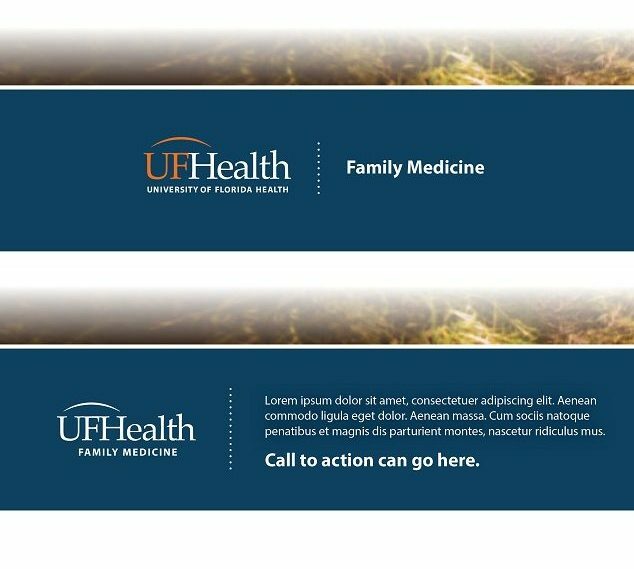 Place the UF Health logo or the logo for the actual practice, entity or service line (eg: UF Health Family Medicine). 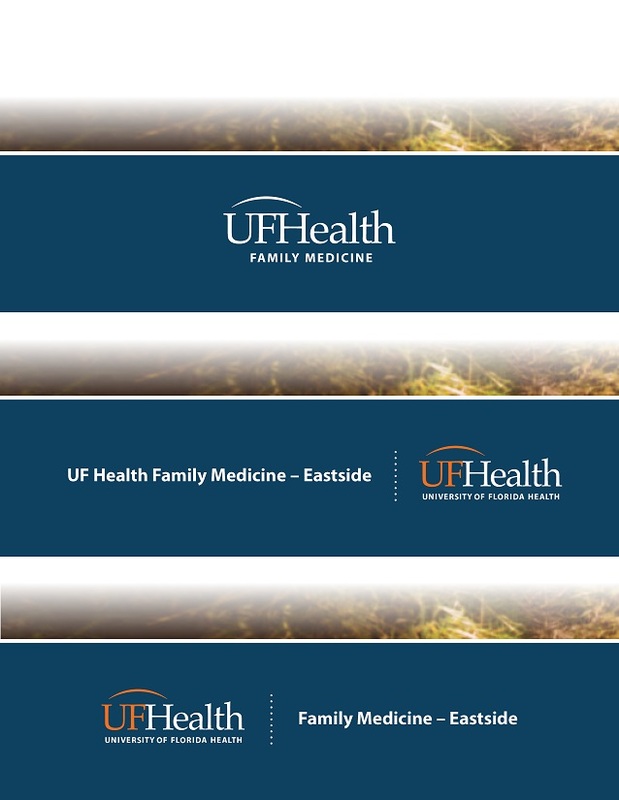 Place UF Health logo, then vertical dotted line, then practice name according to UF Health naming conventions. This can be reversed. 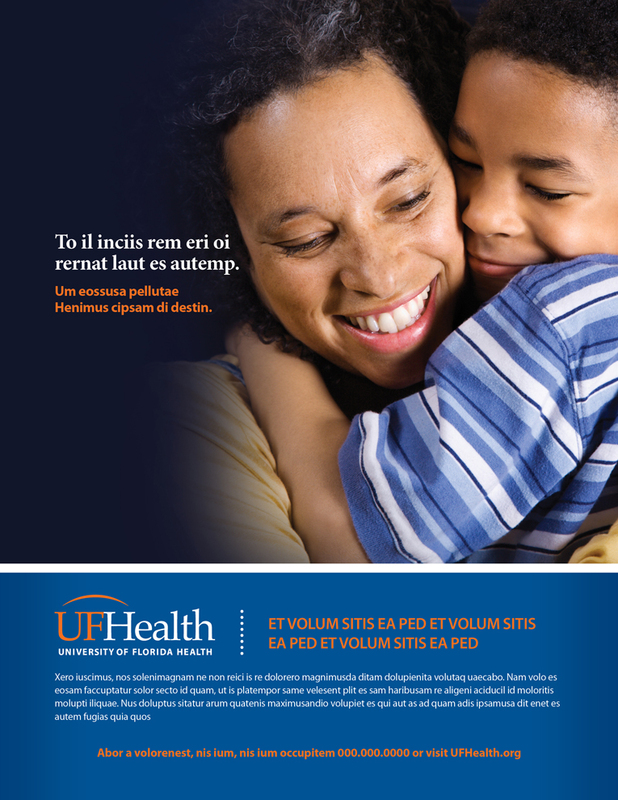 Place UF Health logo or practice or entity logo, then vertical dotted line, then address, body copy or call to action. This can be reversed. 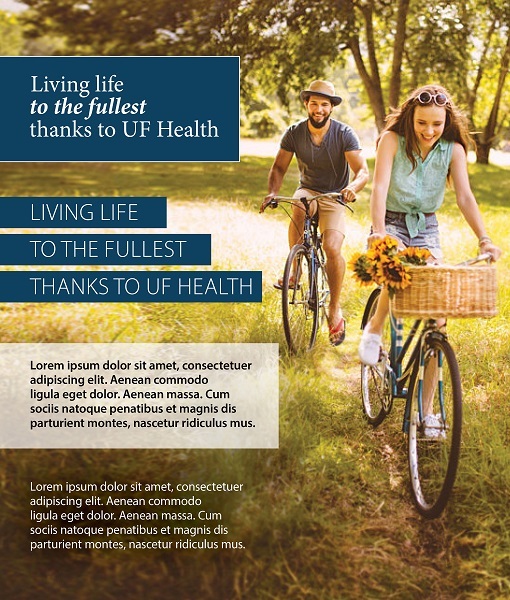 When practice, entity or service line wording is to the left of the logo, “UF Health” must remain in the name. 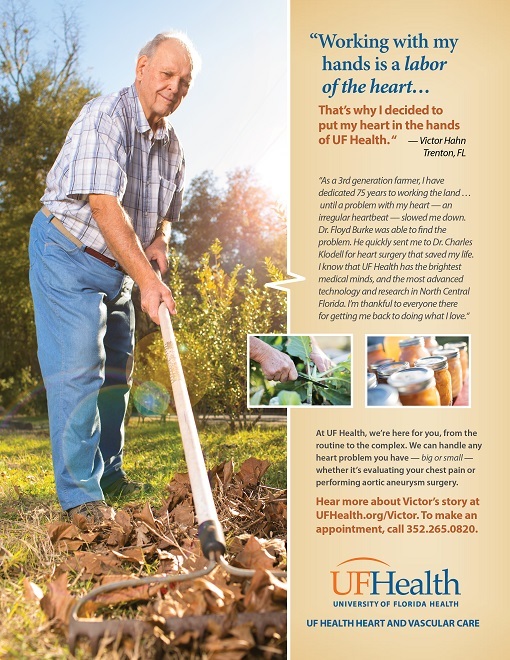 If the practice, entity or service line wording is to the right of the logo, “UF Health” may be dropped from the name. The dotted line can be used as a text or element separator, but it should never be used to replace the white line, which is featured element of the brand look and feel. 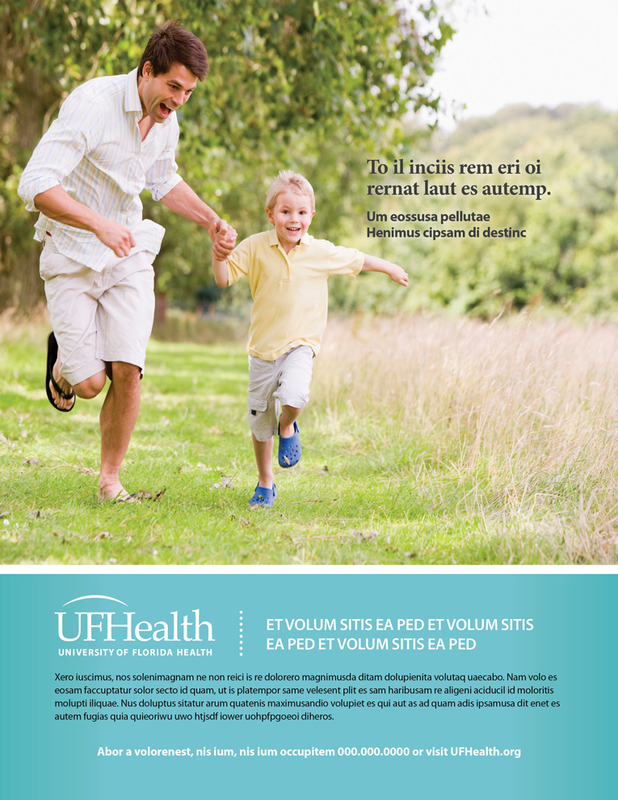 UF Health logos must appear on front page of piece. Logo must appear in the bottom quadrant/lower third of the piece. 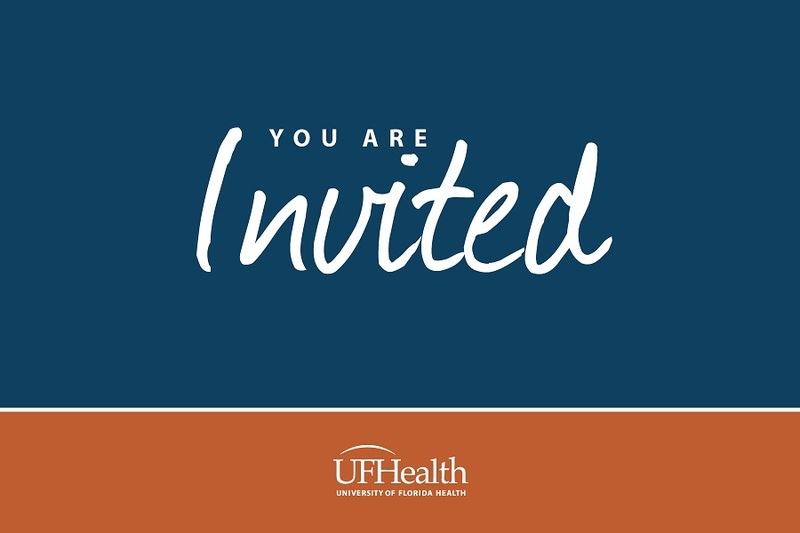 The UF Health logo should only be used as an anchor or signature, rather than a piece of art or a watermark. Please follow all logo placement and sizing guidelines. The “clear space” around the logo should be preserved at all times. 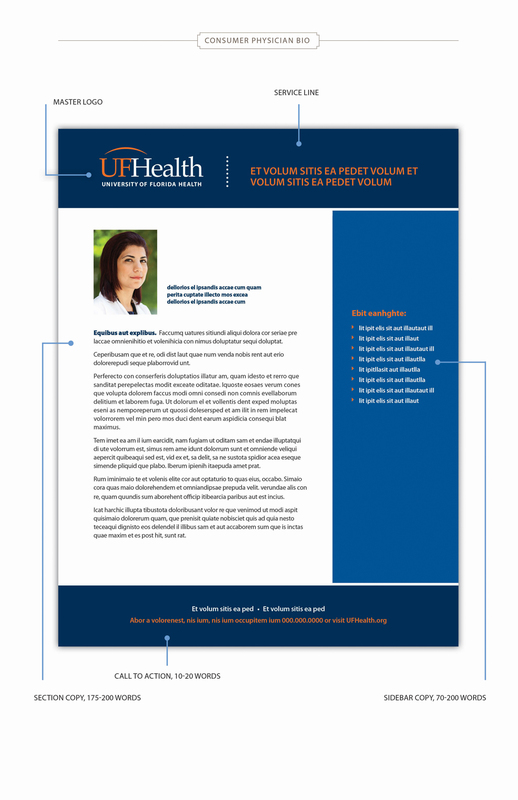 It is permissible to set headline copy in a single, one-color box or multiple, one-color boxes so that it stands out against a busy photo. 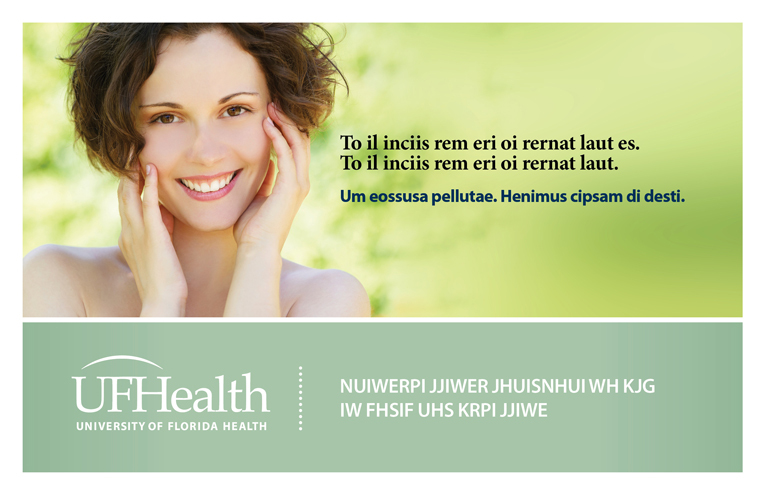 It is also acceptable to use a form of a drop shadow behind the copy to help it stand out. Box may use a white outline not to exceed a specific weight. The box must have only 90-degree angles; no curved lines. 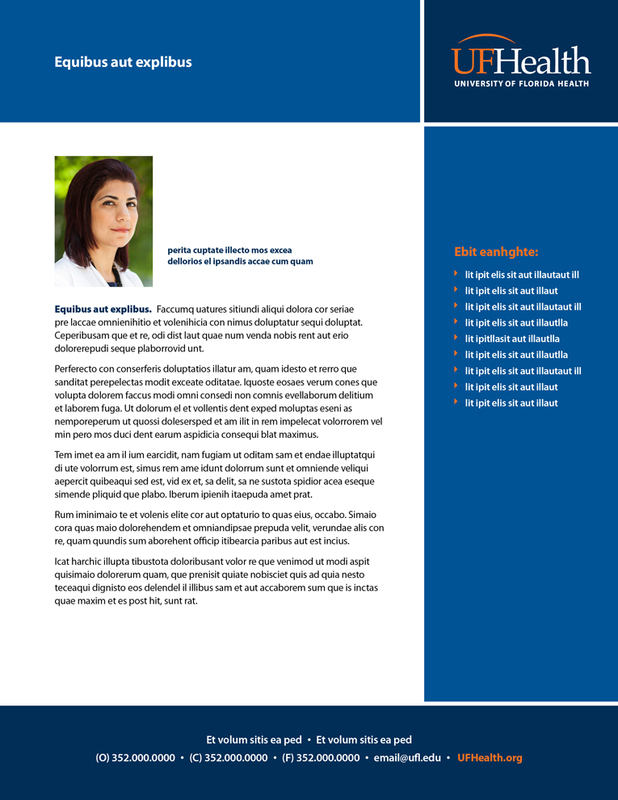 The size of the headline copy and body copy can be changed as needed based on the image(s) placement and amount of content. 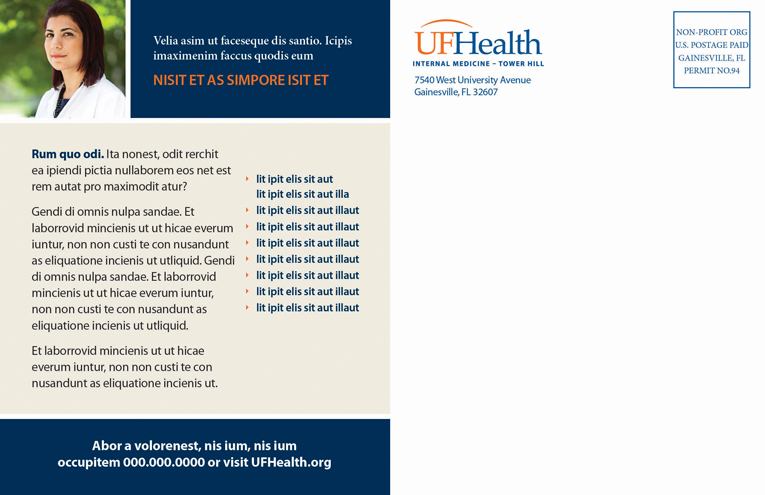 Variations in fonts and font styles are allowed (italics, light, for example), so long as they are our corporate fonts. Headline should always be found in top quadrant/top third of the piece. Body copy should be sans serif for maximum readability and not be less than 10 pt. font. 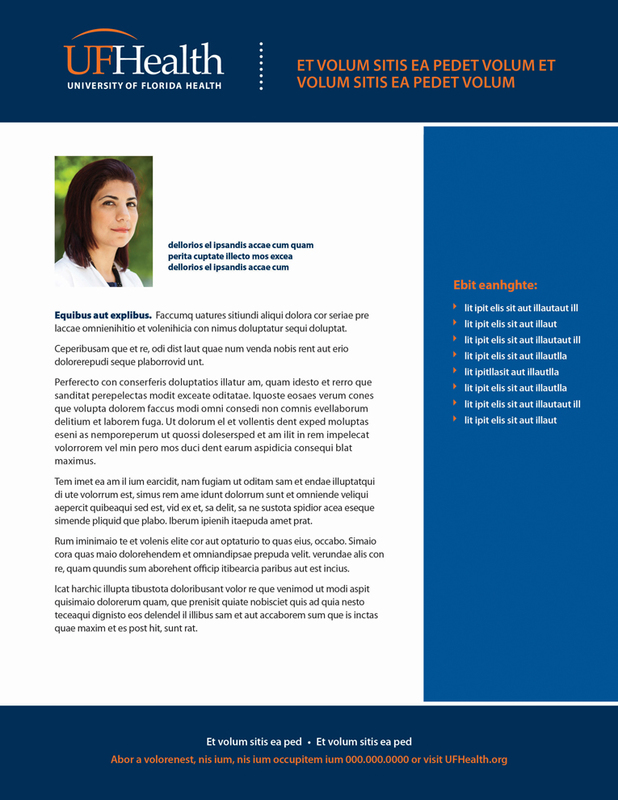 It may contain a drop shadow or be set against a muted white background with a defined opacity. Headlines can be in ALL CAPS if appropriate. Designs must contain as their dominant separation architecture linear (i.e. straight) horizontal and/or vertical lines, and not diagonal, curved or abstract lines. The linear approach must be created through use of a thin, white line not to exceed a specific weight. 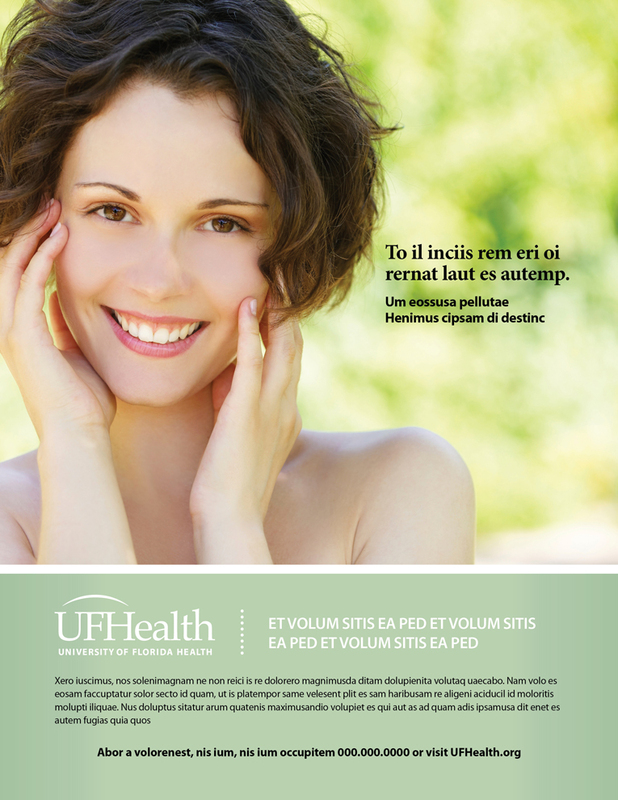 The line can use a slight drop shadow to create depth and dimension. 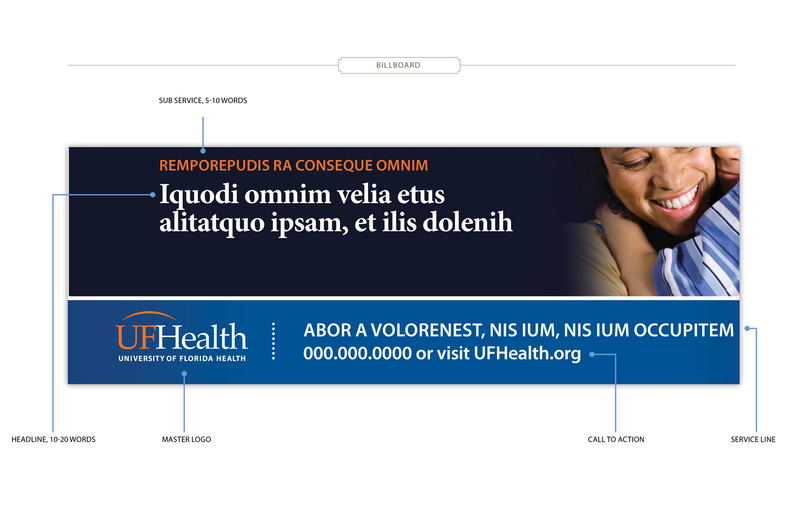 Designs with thin or narrow vertical constraints, such as a billboard or a digital ad banner, need not attempt to use a horizontal line. In these cases, when appropriate and necessary, vertical lines may be the best option. As a general rule, when a picture meets another picture or color block, there must a white line separating the two. The line should extend across the entire document. A dotted line should never be used to replace the linear line. A thin white outline may be used in outdoor and digital advertisements when there is limited space and the logo is placed in a box. 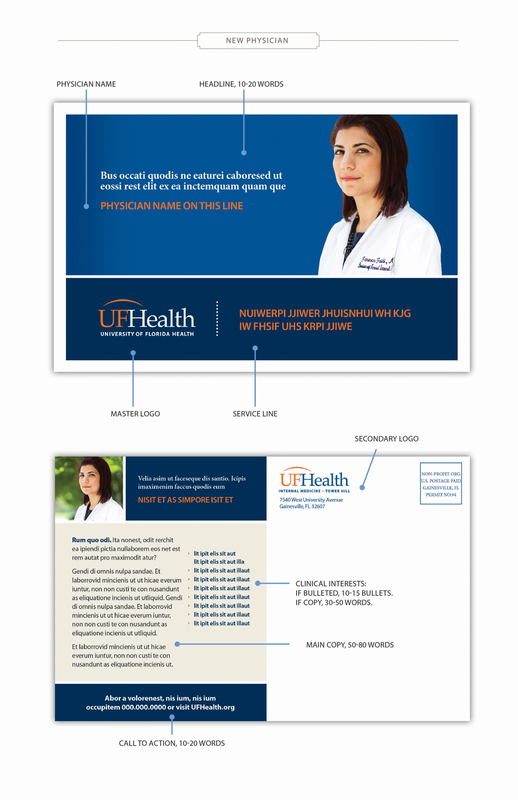 Horizontal or vertical white dividing lines or rules may contain a universally recognized icon that is readily identifiable, appropriate to the piece and relevant to the topic/service, such as a cancer ribbon or EKG pattern. The icon must assume the formatting of the line and maintain its linear flow. Use of such universal icons must have approvals from the marketing directors and director of creative services prior to submitting first proof. It must not compete with any part of another image. Icons may be embedded into a headline word when the message revolves around a system-oriented, strategic initiative with permission from the director of creative services and directors of marketing. That icon may be repeated throughout the piece for strategic emphasis. Icons must be solid-colored, vector art, single-subject, appropriate to the message, and used across a series of related pieces (campaign). Icons should never be used in a single piece that exists only as a single instance. 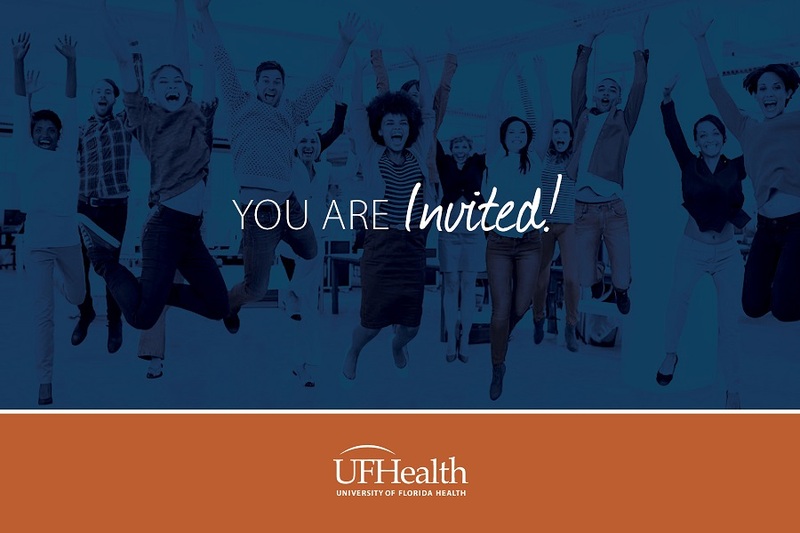 An icon is never to be used in place of a formal UF logo, nor is the icon to be used in visual conjunction with a formal UF Health logo. An icon is never to be used as a logo in any way. 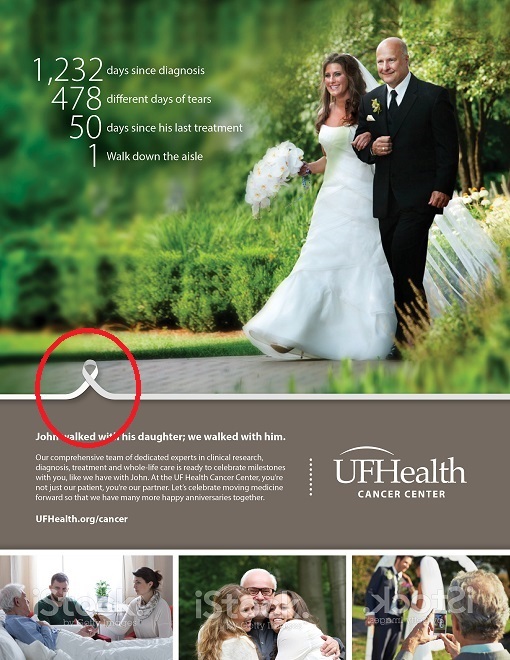 The UF Health logo should only be used as an anchor or signature, rather than a piece of art or a watermark. Illustrations that appear “cartoonish” or that are hand-drawn illustrations are permitted. Note in our color palette that “playful” colors work well in pediatric designs. Bokka font is permissible and specifically tailored for peds.